Hello, Mon! Your lookin' a little blue today. Boss man gettin' ya down? Well turn dat frown upside down! Grab a beer, put ya feet up and dust off dat smooth reggae record you've had stowed away. There's nothin' more revitalizin' than unpluggin' ya-self for an hour or two and getting lost in da heart of Zion. 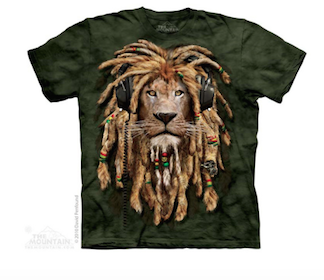 Live the beat with dis Mountain DJ Jahman Adult T-Shirt. It's medium-weight 100% cotton and preshrunk so ya don't have to worry about these locks, Mon. They'll stay iron like a lion in zion for years to come.